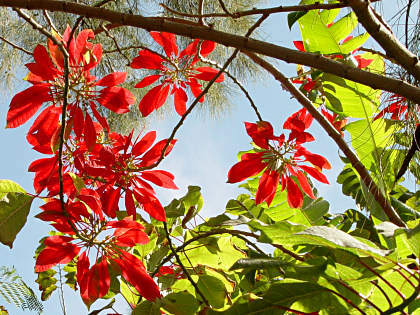 I'm used to seeing poinsettias as small potted plants, but here on Easter Island they grow as full-size trees. 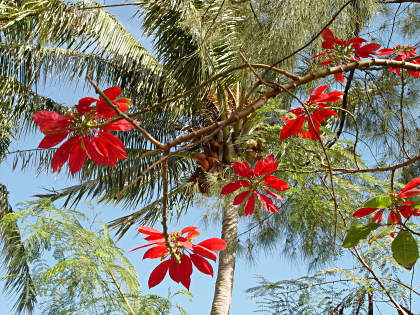 This poinsettia tree was next to the residencial. On the way back to the residencial I stopped at a souvenir shop that advertised rental cars and arranged a car for tomorrow. The daily rate is $40 US but you also have to pay for fuel. I figure that tomorrow I'll head over to the moai quarry at Rano Raraku and thoroughly explore it. To help navigate I bought a "trekking map", a large detailed topographic map that also showed streets, trails, archaeological sites, and even individual houses. Finally, back at the residencial I took a luxurious hot shower to wash off weeks of salt and dirt. It felt great even though the hot water pooped out after a couple of minutes. After cleaning up, I walked up the hill to the small market across from the church and bought dinner, which consisted of an orange and a tube of cookies which I ate in my room. Several times today I caught myself staggering or lurching as I walked around Hanga Roa. After being on a rolling and pitching boat for so long, it will take a little time to develop my shore legs. Plus I haven't had much practice walking for the past few weeks, and by the end of the day I was tired. Now that I'm back on shore, it's nice to have privacy again, to be alone with my thoughts in quiet surroundings. Although I enjoyed being with Marcie and David, I normally live by myself and enjoy my own company. This is also the first time in more than two weeks that I have worn shoes and socks, as well as the first time in the entire trip that I spent a significant amount of money (for airfare, hotel, and car rental). I haven't read a newspaper or listened to the radio since I left Baltimore. During the trip, we heard nothing about the state of the country or the world, except for one bulletin via Pactor about the death of former President Reagan. Despite the lack of news, I suspect that national and international affairs will be depressingly similar to the state of affairs when I left civilization three months ago: warfare, strife, economic woes, political machinations and mudslinging—in other words, the usual day-to-day foolishness of a civilization consumed by self-interest. Being on the boat was like being a castaway from the trials and tribulations of the complex modern world, though you substituted other trials and tribulations (like storms and boat problems) and other complexities (like passage planning, navigation, and repairing and maintaining gear).